Have you ever wasted time looking at a Rental Ad with NO GOOGLE MAP of the property's exact location? That's because they don't want you to see it! Bait and switch! Unfortunately, some Rental Management Companies intentionally misrepresent the exact location of properties in their ads. You wind up looking at listings of "St. Augustine Beach" homes that are 20 miles to the north near Jacksonville, or 20 miles south, in Palm Coast! One of the largest Property Management Companies in St. Augustine (you've probably already guessed who) routinely practices this deception! We're located in the quiet Butler Beach section of St. Augustine Beach, only a short 7.5 miles (15 minutes by car) from the heart of downtown St. Augustine, FL. 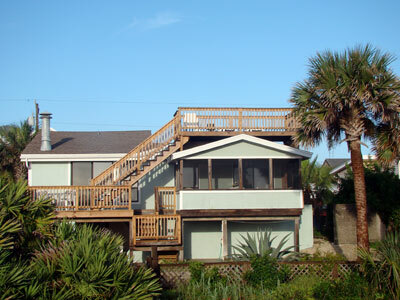 Atlantic View is a quiet, pedestrian, residential side-street located three blocks east of A1A in the Butler Beach section of St. Augustine Beach. There are no condominiums or commercial businesses on our quiet street, hence we have no heavy automobile traffic. We are only 7.5 miles from downtown St. Augustine (about 15 minutes by car). Our location is VERY convenient to everything St. Augustine offers. Publix and Winn-Dixie are exactly 2 miles to the north. The Gator Farm, the Lighthouse and the Ampitheater are only minutes away. We are surrounded by over 20 excellent restaurants within 2 miles. Please try the interactive map above and see how close all the attractions are to our home, while at the same time providing you with a peaceful, quiet, relaxing oceanfront getaway! We are NOT affiliated with Vacation Rental Pros!